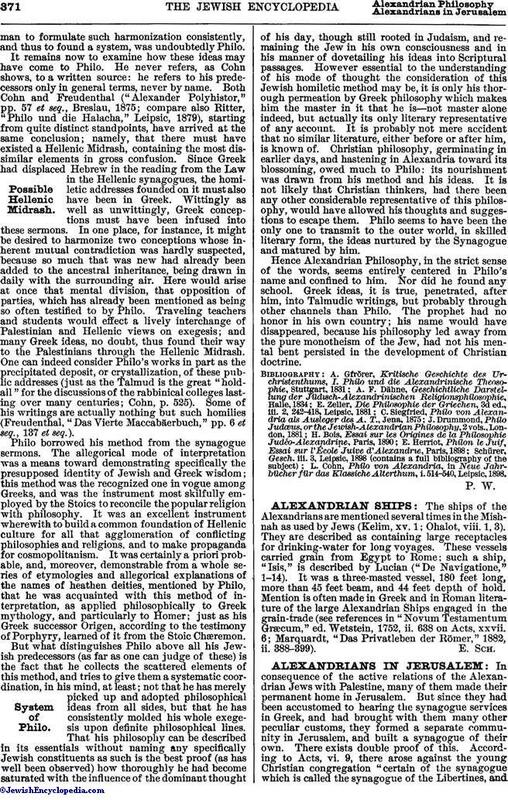 The ships of the Alexandrians are mentioned several times in the Mishnah as used by Jews (Kelim, xv. 1; Ohalot, viii. 1, 3). They are described as containing large receptacles for drinking-water for long voyages. These vessels carried grain from Egypt to Rome; such a ship, "Isis," is described by Lucian ("De Navigatione," 1-14). It was a three-masted vessel, 180 feet long, more than 45 feet beam, and 44 feet depth of hold. Mention is often made in Greek and in Roman literature of the large Alexandrian Ships engaged in the grain-trade (see references in "Novum Testamentum Græcum," ed. Wetstein, 1752, ii. 638 on Acts, xxvii. 6; Marquardt, "Das Privatleben der Römer," 1882, ii. 388-399).